When you pick up an e-cigarette for the first time, you are confronted with almost limitless choices. We don't just mean picking what color your device is—although that is certainly one of the many options—we're talking serious customization. One of these choices you must decide on is between single coil and dual coil configurations. When we say the word "coil," what we're talking about is the heating element inside of your atomizer (atty), cartomizer (carto), or clearomizer (clearo). Every e-juice attachment has at least one coil. Although there are a number of differences between attys, cartos and clearos, there are only two possible coil configurations: single and dual. So what's the deal with single coil vs. dual coil e-cigarette configurations? Is one better than the other? Even though each setup has its advantages and disadvantages, there is no one-fits-all solution for getting the perfect vape. It all comes down to your individual e-smoking habits. 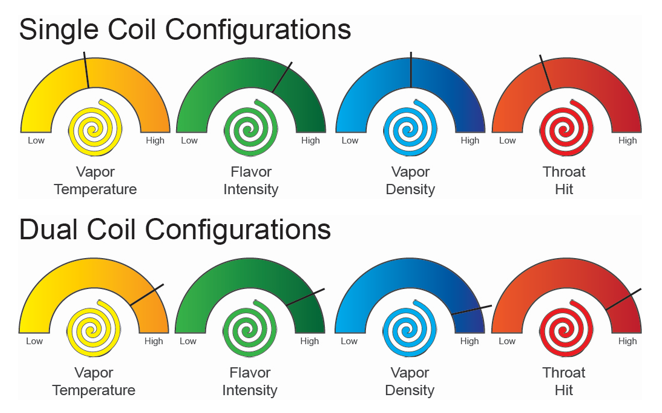 If we use a car analogy to understand coil configurations, a dual setup is like an all-wheel drive vehicle, while single coil e-cigarettes are comparable to a car with front-wheel drive. Here is a graphic that helps further explain the differences between single vs. dual setups. Below that, you will also find a list of the pros and cons of each configuration. A heating coil is a looped resistance heating alloy wire. One end of the coil is connected to a positively charged terminal and the other end is connected to a negatively charged terminal. When your e-cigarette battery sends electricity to the coil, e-juice is heated up to the point of vaporization. A standard single coil setup is when only one coil vaporizes the e-juice. Generally consumes 10-30% less battery power than dual coil configurations. Typically burns through e-juice at a slower rate since only one coil comes in contact with the liquid, thus making your bottles last longer. Rebuilding single coil e-cigarettes are easier because it is a simpler design. Unless you are an advanced user, we recommend buying pre-made kits so you don't have to mess with winding the coils and securing them to positive and negative posts. Single configurations have a lower density of vapor production than a dual setup. Even though the time difference may not be noticeable, single coil e-cigarettes take longer to heat up completely. Dual coils work just like single coil e-cigarette configurations, the only difference is there are two coils instead of one. In a dual coil setup, the wattage is evenly distributed between two the two coils. This gives your e-cigarette the ability to operate at double the power and, at least in theory, double the vapor production. Produces stronger, warmer, and higher volumes of vapor production because the greater surface area of contact area between e-juice and coils. Since two coils heat up liquid faster than one, a general rule is a dual coil can deliver the same amount of vapor in less time than a single coil. Burns through e-juice quicker since more liquid is vaporized to get a thicker vapor cloud. Dual configurations are harder to rebuild because of the extra coil. In the end, deciding whether you want a single coil or dual coil configuration boils down to what you value more – greater vapor production or more battery life. However, we recommend that every e-smoker tries both setups at least once. Here at VaporFi, we have advanced e-smoking devices for all styles and experience levels—from our basic cigarette look-a-likes that taste and feel just like traditional cigarettes, to multi-feature e-cigarettes that use the newest dual coil technology on the market. 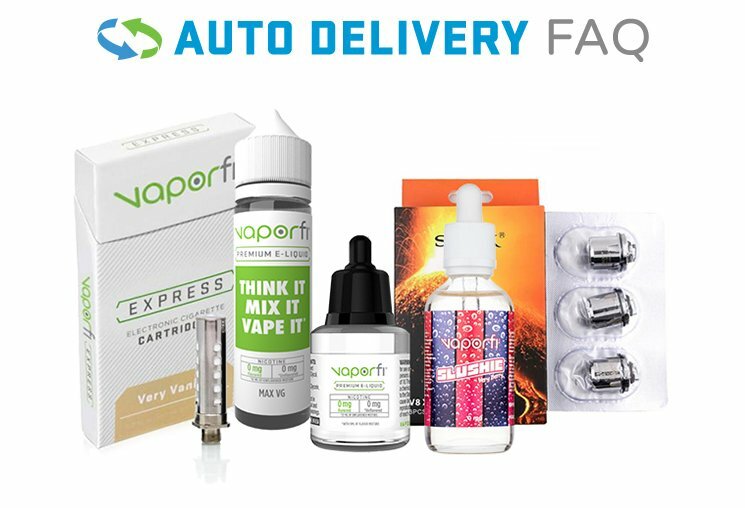 Find an e-cigarette that works best for you by browsing through our online store, or by stopping by one of our physical stores in Central and South Florida.